Throughout the year, Cape Cod Sewer and Drain & Cape Cod Master Plumbers will be offering drawings for valuable products and services. This is just one way we reward our loyal customers and introduce ourselves to new customers. Upon submission of any form on this website (including the one below), you'll be entered into our next drawing. Click here for details. Congratulations to Mark Carchidi of Sandwich, winner of our most recent drawing. Upon submission, you will automatically be entered for our next drawing. Click here for details. 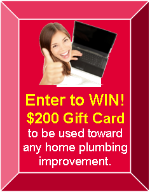 This time we're giving away a $200 Plumbing Improvement Gift Card to be used toward any home plumbing improvement! Want tunes with your shower? Your $200 credit will get you the Moxie(TM) -- Kohler's Bluetooth shower speaker. After your shower, you can pop the speaker out and to keep the music playing throughout the day. Tired of throwing away your money on expensive bottled water? Want to make a difference in your carbon footprint? Why not install a water filter under your kitchen sink? Older family members need an assist in the bathroom? How about replacing your water-wasting toilet with a more efficient comfort-height model? Just a few extra inches makes a big difference to seniors' comfort and safety. Want to get out of the kitchen faster? How about instant hot water at your kitchen sink. Want a quick update for your tired bathroom but don't have the budget for a full renovation? You'll be amazed at the difference new designer faucets and shower heads can make. Pump don't work 'cause the vandals took the handle? We can fix that too. ​These are just a few of the purchases to which you may apply your $200 gift card. Beginning January 1 and continuing through April 30, 2019, Cape Cod Master Plumbers Inc. will solicit entries via this website for a giveaway this $200 Plumbing Improvement Gift Card. Participants are to complete any webform on this website. One entry per household per contest period. Contest is open to adults 21 or older who own homes in Cape Cod Master Plumbers trading area as described on this website. The winner will be selected using a random sequencing program on or before April 7, 2019 and announced in our newsletter later that week. $200 credit may be applied to purchase of any home plumbing improvement installed by Cape Cod Master Plumbers Inc. Prize is non-transferable. No substitutions or cash value. Employees of Cape Cod Master Plumbers Inc., their immediate family members, our business partners and suppliers are not eligible. Questions regarding this contest should be sent to the attention of Cape Cod Master Plumbers Inc., 107 Pinkham Road, Sandwich, MA 02563.